Lords Meade Vocational College is registered with the Ugandan Ministry of Education & Sports and also has been awarded a Uganda National Examination Board Examination Centre for both ‘O’ and ‘A’ level examinations. Lords Meade Vocational College is governed by a Board of Governors consisting of people who represent the Tofta Educational Trust (the Foundation Body), staff, former students, parents, and the local community. It has a full complement of administrative and teaching staff. All staff are qualified Ugandan nationals. Construction of the College was started in August 2001 and is still ongoing. The College opened for students in February 2002. 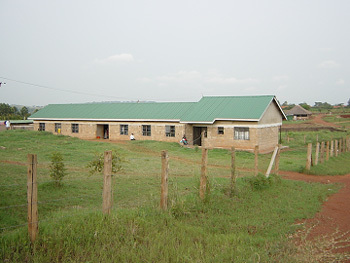 The College was officially opened in August 2003 – by the Ugandan Minister of Education. The College caters for Senior 1 (age 13) to Senior 6 (age 19+). It caters for both boys and girls, & both boarders & day students. Boarding facilities in separate dormitories on the school compound cater for OVER 600 students who require boarding facilities. 100 day students commute up to 10 kms. The College currently has facilities for over 700 students – it hopes to expand the current facilities to accommodate up to 800 students. 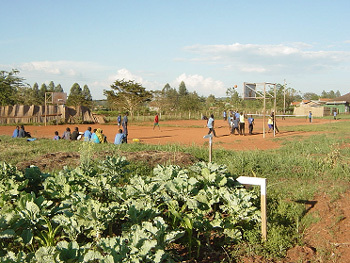 Many of the students come from disadvantaged homes. Over 100 students are assisted by the Tofta Educational Trust – the Foundation Body. The start-up grant was financed through the sale of the founder’s late mother’s home in UK. One of the 2 buildings housing the girls dormitories. A two- bedroomed staff house is attached. This building houses 84 girls. The College combines both academic & vocational subjects with aim of making students job makers. 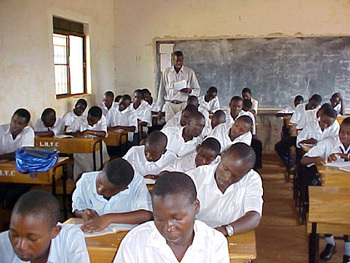 All teaching is carried out in English as it is the official language of Uganda. Academic subjects at 'O' level include: English, Literature in English, French, Kiswahili, Mathematics, Physics, Chemistry, Biology, Religious Education, Geography, History, Entrepreneurship, and Fine Art. At 'A' level: Humanities subjects include: Economics, Religious Education, Geography, History, and Fine Art. Science subjects studied at 'A' level inclue: Biology, Chemistry, and Physics. Mathematics is also taken at 'A' level. Due to lack of facilities there are up to 70 students in some of the lower classes, which leads to cramped conditions and unsatisfactory teaching conditions. 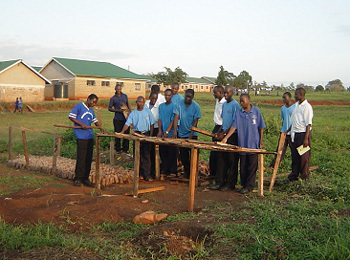 Vocational subjects include: Agriculture, Brickwork & concrete practice, Carpentry, Computer studies, Cookery and Nutrition, Tailoring, and Technical Drawing. Games and sporting activities aim at developing the whole person. Students learn vocational subjects like brickwork and concrete practice. 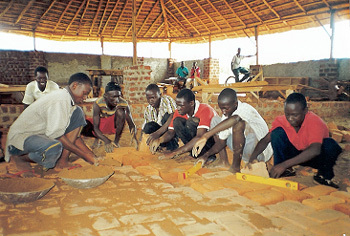 They laid the brick floor for the main ‘Africa’ Assembly Hall. Computer training is one of the vocational subjects taught. 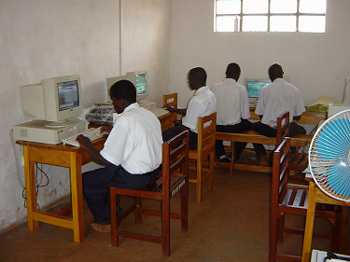 Makerere University – the main university in Uganda has recommended that all undergraduates should be computer literate. 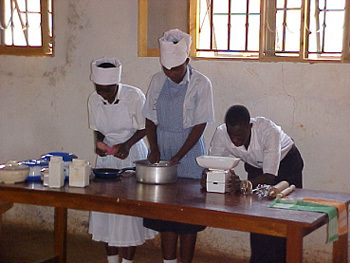 Cookery and nutrition is one of the vocational subjects taught. It is especially important to the girls who have lost their mothers as they miss important basic family care skills that would have been passed on by their mothers. Carpentry is not only one of the vocational subjects on the syllabus – it is used to make furniture for use in the College. Students varnish beds that are being used in the College’s sick bay. Other furniture is used in the library as well as the laboratory. Furniture has also been made for other local schools. 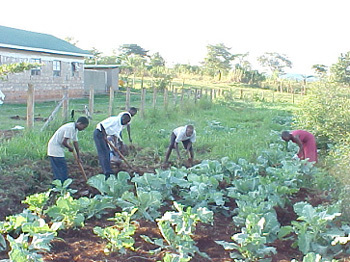 Agriculture is taught to encourage self-sufficiency. The vegetables are added to the students’ diet. The students also enjoy milk from the College’s cows and meat from the College’s goats. 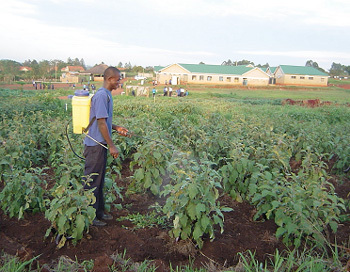 The students are encouraged to care for the environment – they prepare organic fertiliser and pesticides for use on their vegetable gardens. Again, the vegetables are used in their diet. The students care for their environment – they have grown over 2500 trees from seed, and over 1000 trees have been planted around the College’s compound. These trees will provide fruits as well as timber for construction and firewood, helping make the College self sufficient in the future. Other trees have been sold to local schools. Sports are encouraged as they assist in developing the whole person. 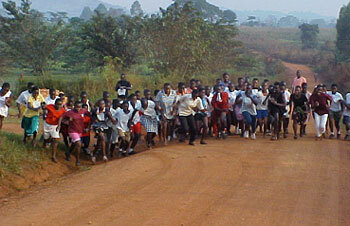 The start of the girls’ cross-country. Basketball and tennis are popular with the students.